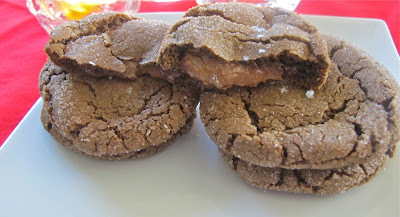 I was looking for a little cookie recipe that used caramels, oh and chocolate is always good too! I found this combo on the blog, comfort of cooking. In a large bowl, cream together sugars and butter, add egg and vanilla and mix until well blended. Add flour, cocoa powder and baking soda, mix well. Cover bowl and refrigerate 30 minutes. Take about 1 Tablespoon dough, roll into a ball and place 1 Rolo in the center, cover with dough. Roll each in sugar. Place on ungreased baking sheet and press slightly. Sprinkle with pinch of sea salt. Bake 8-10 minutes, cool and transfer to cooling rack.